John Tradescant the Younger (1608-1662), Gardener and collector. Sitter in 7 portraits. Thomas De Critz (1607-1653). Artist associated with 1 portrait. 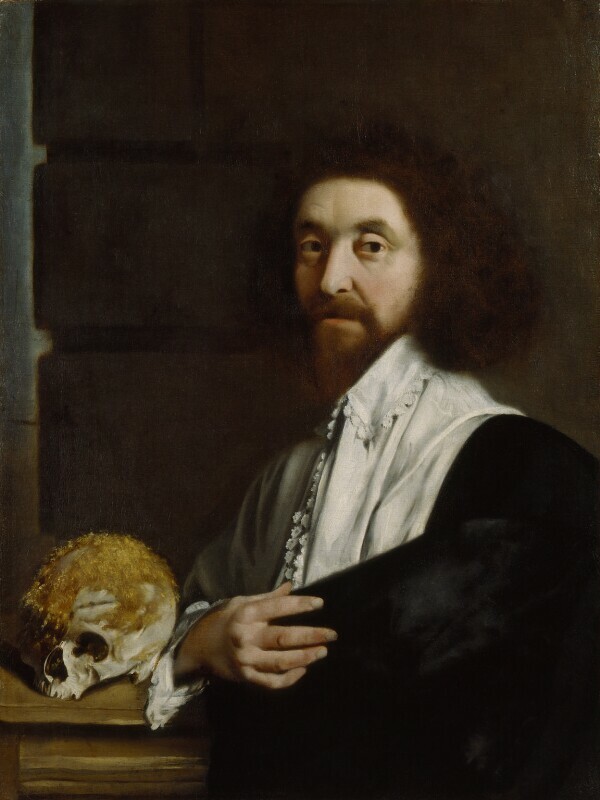 The moss growing on the skull in the portrait is probably in allusion to the belief that a powder made 'out of the mosse of a man's scull' was 'a soveraine remedy for the falling sickness (epilepsy)'. Politician, Sir Henry Vane, the younger, in promoting English liberties on Scotland rather than pursing its annexation, achieves its nominal consent for inclusion to the emerging republican commonwealth. Nicholas Culpeper, herbalist and astrologer, publishes The English Physitian. Extensively illustrated, Culpeper book written in the tradition of astrological medicine, lists native medicinal herbs indexed to common diseases. Architect, Inigo Jones dies at Somerset House. Clergyman, Peter Heylyn, publishes Cosmographie, a comprehensive description of the known world. First Anglo-Dutch war, fought entirely at sea, erupts principally over trade disputes. General at Sea, Robert Blake, leads the navy in the first encounters against the Dutch navy commanded by Lieutenant-Admiral Maarten Tromp. Oliver Cromwell's Act of Settlement of Ireland imposes death penalties and confiscates land from Irish Catholics.